After dressing casually, the four of us climbed into the rental car and headed down toward "the strip" where there are a lot of restaurants. We had our bellies and minds set on Smokey Joe's, which specializes in ribs. Ordering half racks (for us women) and full racks (for the men), we dug in with passion! Crunching and munching our way through the side orders of fries or hash browns and slaw, we filled our bellies, then, like others around is, asked for a box. Looking around at each other when our waiter asked us about dessert, at first we all said we were too full. Then, the words, "let's just do it" came out of my mouth. Yep, served family style, we all got one...a deep fried Oreo and some pretty awesome vanilla bean ice cream topped with chocolate sauce! You can see only three spoons in the pic...mine was in my mouth!!! Mmmmmmmmmmmmmmm...ribs. One of my favourites. sounds wonderful. Oreo's are my favorite cookie. Looks so yummy I want some for breakfast ! I can't imagine what this dessert must taste like! Every kind of sweet that we like all rolled up into one wonderful dessert. 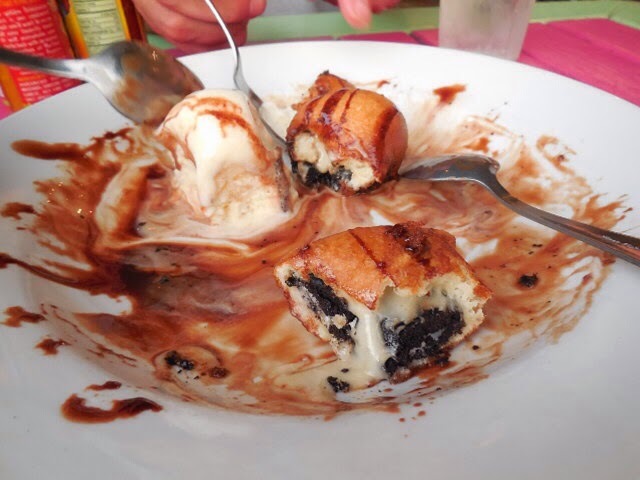 A deep fried Oreo sounds really, really good! Oh yummy! Sharing is good, less calories.